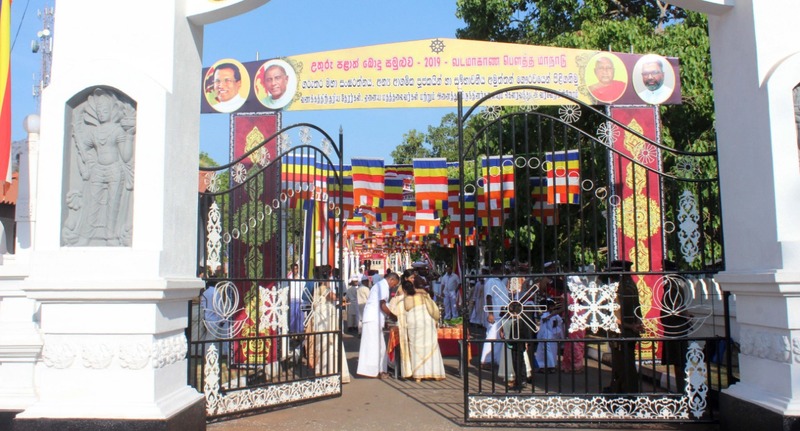 First ever Northern Province Buddhist Conference commenced today (29) at Sri Bodhi Dakshinaramaya Temple in Vavuniya. All the arrangement for the conference is completed. The conference is being held under the patronage of the Chief Sangha Nayaka of Northern & Eastern Provinces, the Chairman of Vavuniya District Ven. Siyambalagasveva Vimalasara Thera, Minister of Buddha Sasana Gamini Jayawickrama Perera and Governor of Northern Province Dr. Suren Raghavan. This first-ever Northern Province Buddha Conference is being held under the guidance of Governor Dr. Suren Raghavan with the complete contribution and support of Northern Province Governor’s Secretariat along with Ministry of Buddha Sasana, the regional political leaders, the tri-forces and government officials. The prayer for the people who died during the war will also be held. The conference commenced today at 8.15 am at Vavuniya Sri Bodhi Dakshinaramaya Vihara. With the blessings of the religious leaders of all religions, the Buddhist Theros were invited after the religious rituals followed by the various cultural events and the religious observances. In the evening, there will be a discussion. Activities to promote religious reconciliation, comments and proposals are to be taken in the discussion. It is expected that this Northern Province Buddhist conference will give a good message to the Sri Lankans and the world. Journalists representing all the media have come to Vavuniya to broadcast this great function to the world’s people.